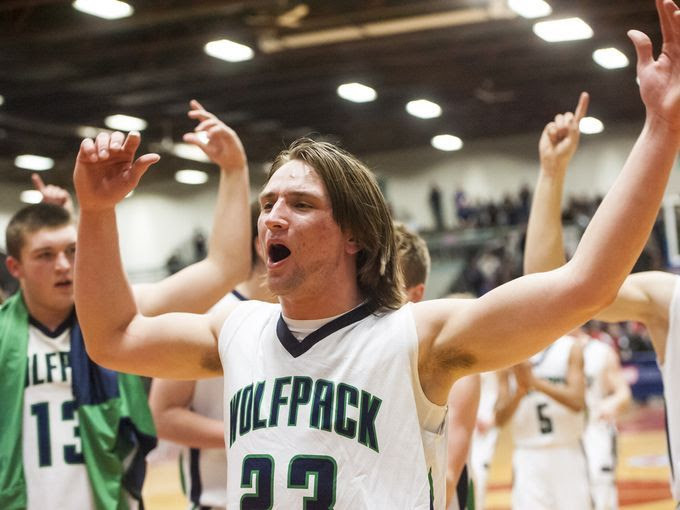 Patrick O’Connell yells to fans after Glacier won the State AA Championship in Four Season Arena Saturday. GREAT FALLS — The Glacier boys shut down Bozeman with their best player on the bench, holding off the Hawks to win 46-42 and claim the first Class AA state basketball championship in school history on Saturday evening. The Wolfpack controlled play all game, but watched a once commanding lead dwindle in the fourth quarter. Up 35-28 entering the quarter, Bozeman cut the lead to 39-36 midway through the frame and got even as Glacier senior Jaxen Hashley fouled out. The leading scorer and rebounder for the Wolfpack and literal and figurative center of the offense and defense picked up his fifth foul with 3:30 to play and caught a technical foul for good measure, giving Bozeman a pair of free throws. Hawks senior Bailey Harlin nailed both shots to cut the Glacier lead to 39-38. Even as the game tightened up and the crowd roared with anxiety, there wasn’t any panic on the Glacier bench. “I said, ‘We don’t need to panic,’” Gilman said. Gilman immediately answered with a mid-range jumper and junior Caden Harkins followed a Bozeman layup with a pair of free throws after being fouled in the backcourt to give Glacier a 43-40 lead. Caden Harkins rebounded the Hawks attempt to tie from deep and hit one of two free throws on the next trip down. Bozeman hit a high-arcing teardrop in the lane to cut the lead back to two points with 26 seconds to play, but O’Connell grabbed the rebound in traffic on the Hawks final attempt to take the lead, a corner 3 that rimmed out and bounced high in the air before falling wide. Fouled after he came down, O’Connell calmly sank a pair of free throws to ice the win with six seconds to play. Glacier opened the game strong in the first quarter, reeling off nine straight points to take an 11-5 lead midway through the frame. Glacier led by nine points before hitting a lull entering the second, going scoreless for six minutes to allow Bozeman to retake the lead. The Wolfpack closed the half strong, however, holding Bozeman without a bucket for more than three minutes until a late 3 sent the game to half tied at 24-24. The Glacier defense remained strong in the third quarter, holding the Hawks without a field goal in the quarter and without a point for the first six minutes in taking a 35-28 lead into the fourth. Bozeman senior Lance McCutcheon hit a pair of 3s at the start of the fourth and Glacier missed the front end of a pair of bonus free throws to watch its lead slim. It still held a three-point advantage when Hashley picked up his fifth foul on a charge call. His backups didn’t waiver however, leading Glacier to the first Class AA boys basketball title by a Kalispell school since 1989. It was Glacier’s first championship game since the school opened in 2007. McCutcheon had a game-high 19 points and 10 rebounds to lead Bozeman. O’Connell had a team-high 11 points to lead Glacier, which saw nine players score. Glacier (20-3) – Caden Harkins 0-4 5-6 5, Tadan Gilman 2-4 2-4 6, Collin Kazmier 1-1 0-0 2, Brec Rademacher 2-3 0-0 6, Jaxen Hashley 4-9 0-1 8, Pat O’Connell 3-3 5-7 11, Torin Bowden 2-5 0-0 4, Jack Desmul 1-1 0-2 2, Kody Jarvis 1-1 0-0 2. Totals: 16-31 12-20 46. Bozeman (19-4) – Drew Huse 2-10 2-2 6, Callahan O’Reilly 4-11 1-4 10, Bailey Harlin 1-8 2-2 4, Morgan Hostetler 0-1 0-2 0, Mack Anderson 0-1 0-0 0, Lance McCutcheon 7-12 2-4 19, Kyler Ash 1-5 0-0 3. Totals: 15-18 7-14 42. 3-point goals – Glacier 2-7 (Rademacher 2-3), Bozeman 5-25 (McCutcheon 2-3, O’Reilly 1-4, Ash 1-5). Rebounds – Glacier 29 (Hashley 6), Bozeman 26 (O’Reilly 7). Total fouls – Glacier 17, Bozeman 19. Technical fouls – Hashley. Fouled out – Hashley.